Last month we launched some new updated badges. 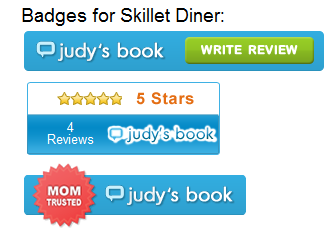 Badges allow local businesses to link to their Judy’s Book reviews from their websites. One of our new badges that prompts users to write a review on the business has improved the submission rate by more than 50% inin a measure we took during a 2 week period. Here’s some steps for getting a free Judy’s Book Badge for your website and gaining more reviews from people who view it. Search for your listing on Judy’s Book. From your profile page click the link to view the reviews on your business. Scroll down and on the right side of the page click the Badge Button. You’ll see a page with badges and code to copy and paste to your website that links to your business listing on Judy’s Book. Furthermore businesses and upgrade to premium accounts at www.judysbook.com/Biz will automatically have badge code generated for their listings and sent to them in e-mail. This entry was posted in Judysbook on November 4, 2011 by judysbookblog.